We built 2 arm rigs, IK and FK. The IK rig is for when we need the hand to stay still or hold something, in an IK arm rig the hand moves the arm or holds the hand still while the body moves. 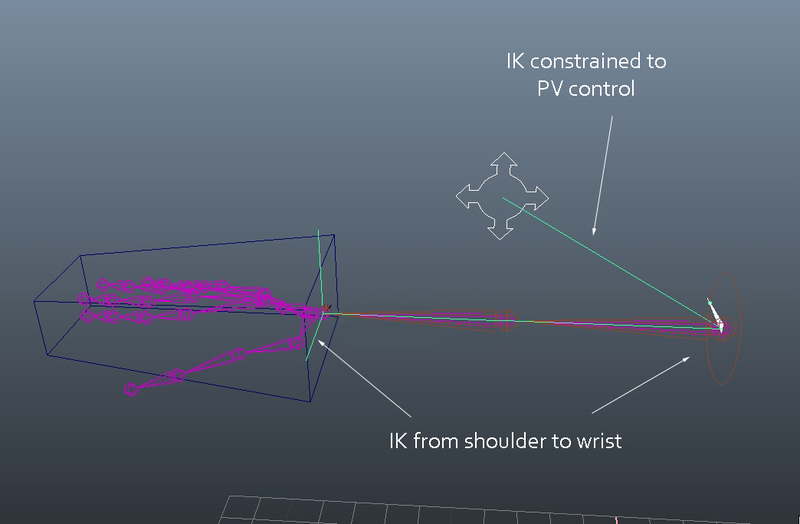 The FK rig swings the arm from the shoulder and elbow joints. Here I describe building an IK rig. Create arm joints opposite and matching to left side. The controller controls arm with an IK RP. This is of course done so that the elbow will bend in the preferred direction every time. 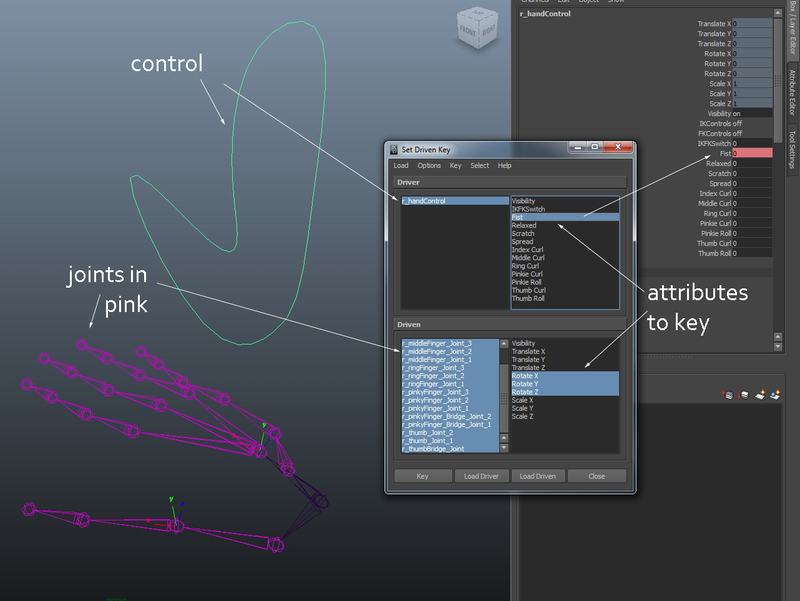 Select RP solver in IK handle options and click shoulder then wrist joints. Doing it this way leaves the hand free to be animated apart from the arm. 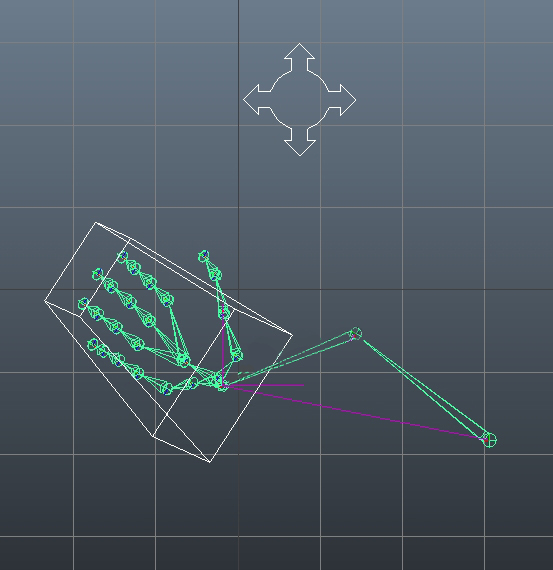 I did this by mistake and have left it as an extra part of rigging an arm for assessment. Making a 2nd hand the same as the first is difficult because it is complex and has to be exactly the same but opposite. Using mirrored joints won’t work because the joint orientation will be wrong and un-fixable. It is important that joint orientation is correct. If orientation is different from the rest of the skeleton rotations will be different and wrong. colour them by putting them in a layer and choosing a colour for it so it is easy to differentiate them, here it’s red. 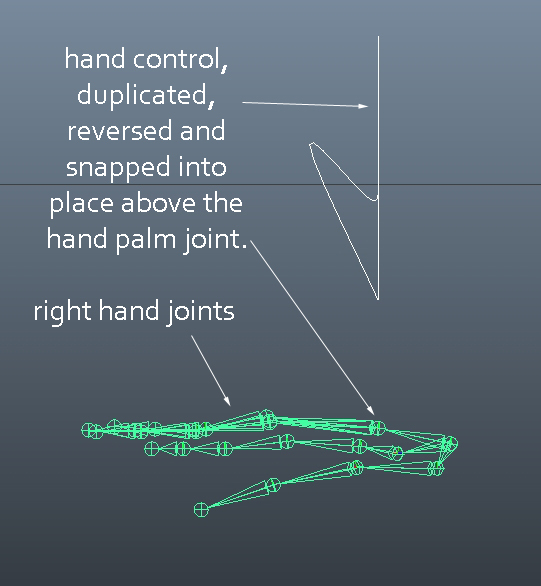 Another way to make the hand joints is import the bind skeleton and copy the hand and hide the rest of the skeleton so you can unhide it to check placement at any time. Duplicate the hand control curve from the other side or make it from scratch in the same manner as foot curve. snap it to the hand palm joint so it is out of the way of the other arm controls. There are 3 different kinds of orientations needed in the hand. 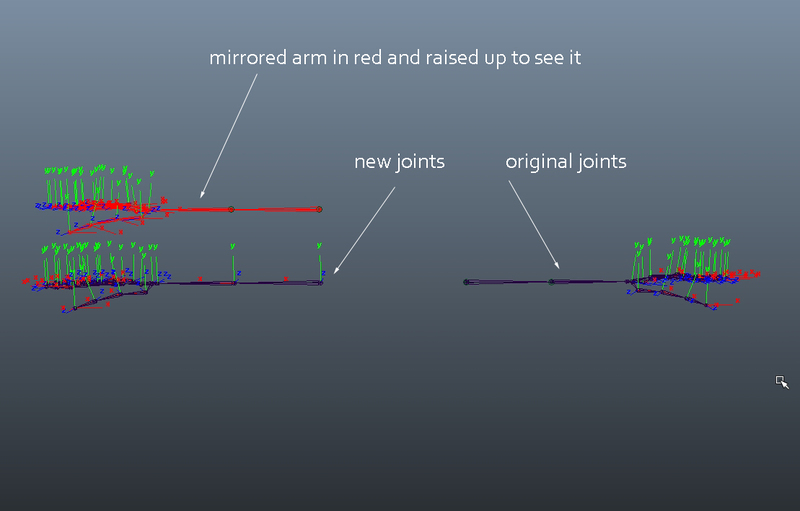 The normal joint orientation with X axis going towards the child joint is the first. World orientation is required for core joints, that have more than 1 joint coming from them, because it cannot point to all the children, cannot choose, would be wrong for at least 1 of them if it could and so it will have to be in line with the rest of the skeleton. The other kind of orientation in the hand is ‘custom orientation’ where we alter the orientation by hand, this is described a bit later. 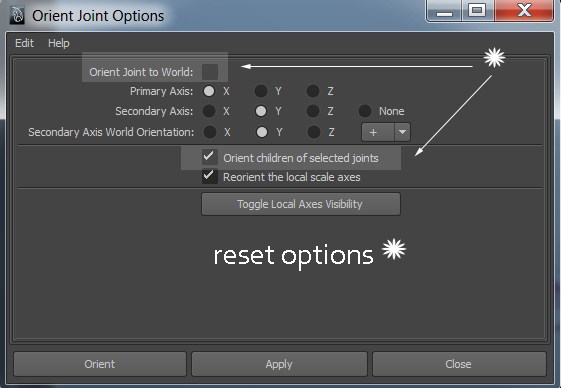 Orient all the joints except the core joints with the options reset of orient joint. To do this un-parent these joint chains in the fingers then orient. 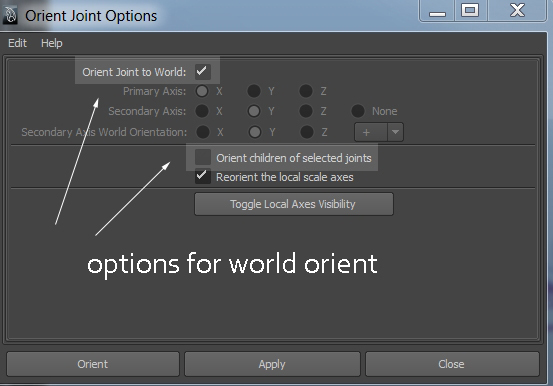 In orient joint options tick orient joint to world and un-tick orient children of selected joints. Make sure the base joints are un-parented and parenting nothing and orient. the thumb bridge joint and pinky finger bridge joint have custom orientations applied to them. This where I realised (too late) that we don’t need to do the hand for the assessment and it had taken me a whole day…… I may as well finish it because I have to do it anyway on the right hand.. Custom orientation is needed at the bridge joints of the thumb and pinky finger so that they can drop down and rotate under the hand in 1 smooth rotation to enable the bringing together of the tips of these digits, this is a specialised movement of the hand. 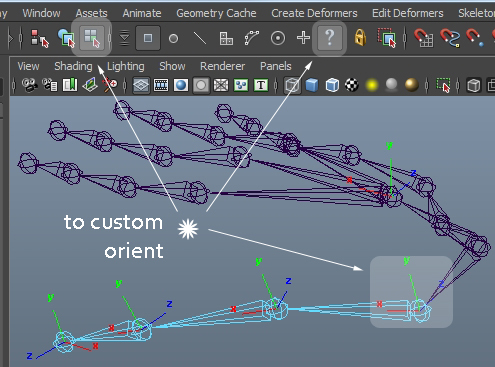 Without the custom orientation it takes many different individual rotations to get there and is bad for animating. Un-parenting joints is often required before orienting joints will work properly. rotate the joint axes as you want and write it down so you can put in the same amounts on the other hand. This is to have any movements which you may want easily available to animate with, in this case for the hand eg relax, spread and individual finger curls etc. 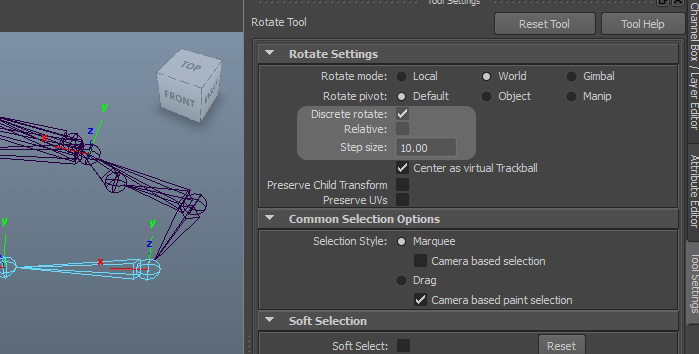 You set keys at 0 for the starting position and say 10 and at 10 you rotate all the joints for the hand to be in the position you want and key it so that when you middle mouse button drag for the attribute the hand moves into position without having to move each joint and rotation individually. add attributes (as for the foot rig) for all the hand movements you want for the control eg fist, relaxed, scratch, spread, index curl, middle curl, ring curl, pinky curl, thumb curl, thumb roll.